The MUC6 gastric mucin is a secreted glycoprotein that plays an essential role in epithelial cyto-protection from acid, proteases, pathogenic microorganisms,, mechanical trauma in the gastrointestinal tract. Mucin 6 expression is highest in the stomach, gall bladder, with lower expression in the terminal ileum, right colon. In gastric cancer, Mucin 6 has an altered expression. 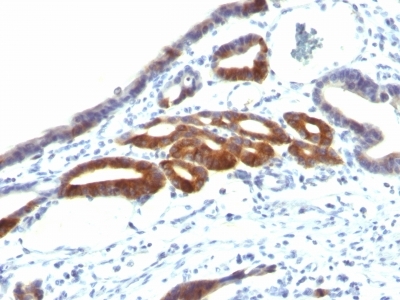 In normal stomach, Mucin 6 is associated with Lewis type 2; Mucin 6 is also expressed in gastric metaplasia, duodenum, pancreas. Mucin 6 is a secretory mucin, located in the deeper mucosal folds of human gall bladder,, its expression is altered with increasing degrees of inflammation. 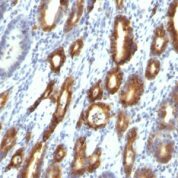 Variations in MUC6 antibody staining intensity in immunohistochemistry on tissue sections are present across different anatomical locations. An intense signal was observed in glandular cells in the seminal vesicle, stomach. More moderate antibody staining intensity was present in glandular cells in the seminal vesicle, stomach. Low, but measureable presence of MUC6 could be seen inglandular cells in the duodenum, exocrine glandular cells in the pancreas and islets of Langerhans in pancreas. We were unable to detect MUC6 in other tissues. Disease states, inflammation, and other physiological changes can have a substantial impact on antibody staining patterns. These measurements were all taken in tissues deemed normal or from patients without known disease. 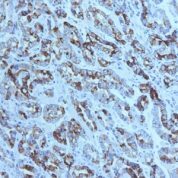 Tissues from cancer patients, for instance, have their own distinct pattern of MUC6 expression as measured by anti-MUC6 antibody immunohistochemical staining. The average level of expression by tumor is summarized in the table below. The variability row represents patient to patient variability in IHC staining. enQuire Bio's MUC6 Anti-Human Monoclonal is available for Research Use Only. This antibody is guaranteed to work for a period of two years when properly stored.